Large Family Home well located not far from Kamala beach. 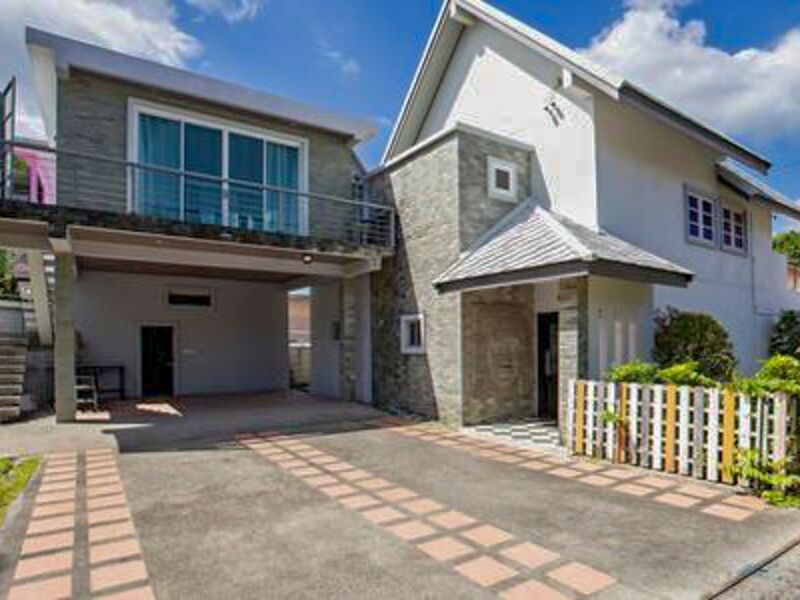 This house is an excellent place for a family holiday in Phuket. - Large open plan living area with sofas, dining area adjoining the kitchen and access to a garden terrace. - Main Kitchen fully fitted with European appliances and a separate Thai Kitchen. - Three well-proportioned Bedrooms. The master has TV, sofabed, an ensuite shower and balcony with mountain views - a great place for morning coffee. The other two bedrooms one of which has a TV and sofa, have direct access to a shared bathroom. There is a large roof terrace although as owners, we rarely used this when we lived in the house preferring the garden space. - Garden and Terrace. The main gardens are to the front and side of the house, are not overlooked and have shaded areas. The house is slightly under a 1 km walk from Kamala beach over relatively flat ground. Kamala Beach is a great choice of beach for the whole family with several foreign and local eateries available. At the Northern end of the beach, you have the option of Cafe Del Mar and HQ Restuarant and Bar (under Twin palms ownership a sister club of Catch) which offer first-class dining and bar all day and are the great place for sunset drinks / dancing the night away. At the Southern end, you have a large selection of restaurants on and close to the beach in Beach Road. They usually are watersports, fishing trips and such like on offer. Two Convenience shops, local Thai coffee shop, massage, travel agent, car rental and pharmacy are literally around the corner from the house and Thai Boxing who run exercise classes just a bit further along the road. Perfect for the family, lovely sunsets and a mix of local restaurants to more upmarket beach clubs. Kamal is very nearby, Patong only 15 minutes by taxi and Phuket Town a frther 15 minutes.